The company said in a press release that it will reduce its planned uranium production by 20 percent for three years starting in January 2018. Major uranium producers were on the rise early Monday (December 4) after Kazatomprom announced plans to cut its uranium output once again. The mining company said in a press release that it will reduce its planned uranium production by 20 percent “in order to better align its output with demand.” The cuts will last three years and will begin in January 2018. According to Kazatomprom, the cuts will result in a deferral of 11,000 tonnes over the three-year period, with 4,000 tonnes being cut in 2018 alone. That will result in a 7.5-percent reduction in uranium output next year. “Given the challenging market conditions, and in light of continued oversupply in the uranium market, we have taken the strategic decision to reduce production in order to better align our production levels with market demand,” said Galymzhan Pirmatov, chairman of the management board at Kazatomprom. Kazatomprom’s decision to cut output for the next three years comes after a reduction in production in 2017. At the beginning of the year, the company said it would reduce its output for the year by 2,000 tonnes. It said at the time that the move would result in a 3-percent reduction in global uranium output for the year. Those cuts also came in the face of oversupply and low prices in the uranium market. Kazakhstan is the largest uranium-producing country by a long shot, and Kazatomprom is currently a state-owned company. However, it is reportedly planning to go public in 2018. The news also follows major uranium producer Cameco’s (TSX:CCO,NYSE:CCJ) November decision to suspend production at its Saskatchewan-based McArthur River mine and Key Lake milling operations by the end of January 2018. “With the continued state of oversupply in the uranium market and no expectation of change on the immediate horizon, it does not make economic sense for us to continue producing at McArthur River and Key Lake when we are holding a large inventory, or paying dividends out of proportion with our earnings,” Tim Gitzel, the company’s president and CEO, said when the news was released. Cameco’s announcement brought a surge of optimism from uranium market watchers, and many suggested that the cuts could kick the beleaguered uranium space into gear. Monday’s news from Kazatomprom has had a similar impact, with a slew of uranium stocks rising on the decision. As of 10:15 a.m. PST on Monday, Cameco’s share price was up 13.29 percent on the TSX, changing hands at C$13.64. 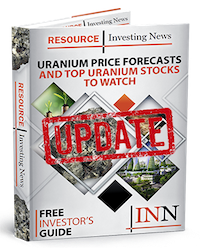 Other smaller uranium producers were enjoying similar gains — Energy Fuels (TSX:EFR,NYSEAMERICAN:UUUU) was up 13.43 percent, trading at C$2.45 in Toronto, while Ur-Energy (TSX:URE,NYSEAMERICAN:URG) was up 10.13 percent at C$0.88 on the TSX. Many exploration and development companies were on the rise as well. Examples include NexGen Energy (TSX:NXE,NYSEAMERICAN:NXE), which was up 15.49 percent on the TSX, trading at C$3.42, and Denison Mines (TSX:DML,NYSEAMERICAN:DNN) was up 12.7 percent at C$0.71. Fission Uranium’s (TSX:FCU) share price was up 12.12 percent at C$0.74. UxC places the U3O8 spot price at US$22 per pound as of November 27.